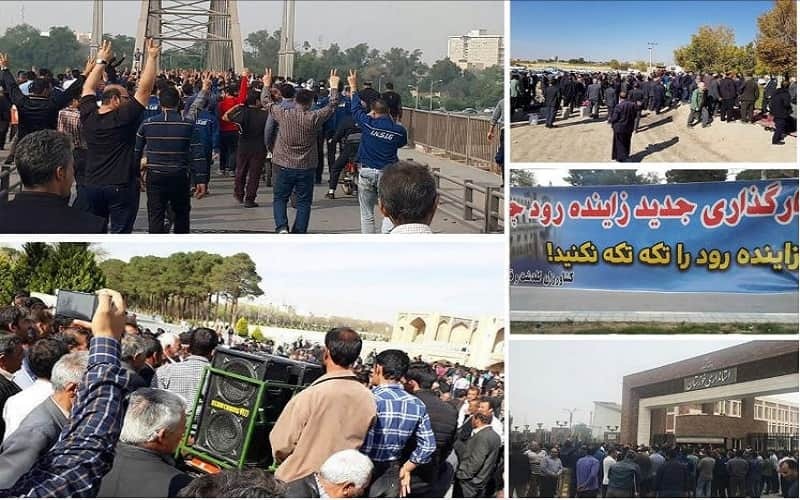 Since three weeks ago the Haft Tapeh Sugar Cane Mill’s hard-working workers gathered in front of the governorate office in Shush south of Iran. Youths, students and workers’ families participated extensively in the demonstrations. Women played a significant role at the forefront. On Saturday, November 17, 2018 a massive demonstration took place in spite of repressive measures and the creation of a climate of fear and terror, including the presence of scores of the special anti-riot and other repressive forces in the police station, governorate and the city.but when the workers did not stop the strike, the suppressive forces arrested and detained some of them. Maryam Rajavi has described the nationwide strike by bazaar merchants and truck drivers as a part of the people’s uprising with the goal of overthrowing the regime and establishing freedom and social justice. She had said under the mullahs’ regime, the wealth of Iran‘s people, which should be spent on economic improvements and people’s prosperity, is wasted on suppression and export of terrorism and external wars and is stolen by the ruling mullahs. The movement of the Haft Tapeh workers and their achievements, regardless of any gimmicks represented by the regime, to confront it is registered in the record of the national uprising of the Iranian people and the history of the rightful movements of our homeland’s workers. The uprising of Haft Tapeh workers has succeeded in bringing many similar demands to confront privatization in other areas up front. The demands that have been hiding under the ashes of oppression and disappointment. Now, by following this example students and even hospital staff are protesting the privatization of education and medical treatment. In the next step, these demands are immediately upgraded to a higher and more fundamental change. And in this way, the guild related demands will lead to the most political demands, just as the demonstrations in December 2017 and summer of 2018 quickly became political and targeted the head of the mullahs’ regime.